Mixers for the wash basin are available in various heights and variants. All of these perfectly match the various wash bowls and basins. For the bath tub, mixers for the bath tub rim and wall or a floor-standing thermostat are available. Matching shower mixers and thermostats for the shower complete the collection. Here we also typically have the interplay between ample surface areas and soft forms. For the shower Axor Urquiola offers a shower column, which perfectly follows the collection's design principle. Overhead showers for wall or ceiling mounting and various hand and side showers are also available. From the bath towel holder and the soap dish to the wall hook, the toothbrush tumbler and lots more: with Axor Urquiola you can design your bathroom impressively, down to the very last detail. 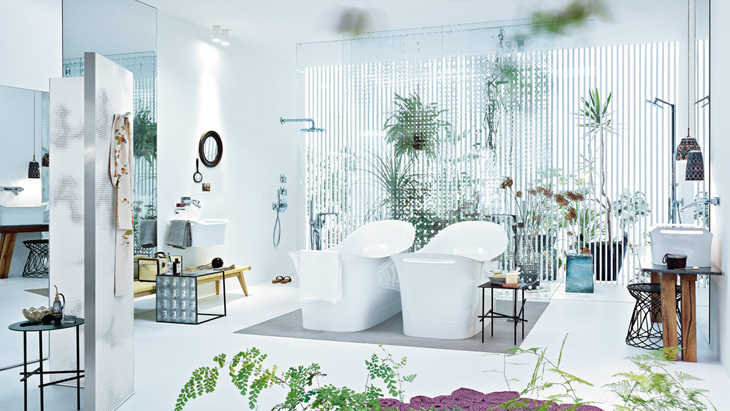 In its design, the free-standing bath tub is reminiscent of the old-fashioned bath tubs. The Axor Urquiola wash basins and wash bowls are adapted accordingly and can be installed on the wall or on a table.